Biomass boilers work in a similar way to standard central heating boilers which use gas, LPG and heating oil with the main differences relating to the way in which biomass fuel is delivered to the boiler and how waste is dealt with. Just like conventional gas boilers, biomass boilers burn fuel to create heat which is distributed around your central heating system and used to provide domestic hot water. Modern domestic biomass boilers burn wood pellets which are fed from an integrated hopper, through an auger into the combustion chamber where they are burned. Biomass boilers can normally replace gas, LPG and oil-fired boilers without having to change the pipework and radiators. Biomass boilers have been used extensively in Scandinavian countries for decades where there is a good supply of biomass wood pellet fuel which generates renewable, sustainable, carbon-neutral energy. The Carbon Trust claimed that biomass boilers provide a “cost effective and practical way to provide space heating and hot water from a low carbon source”. Biomass boilers are not only cheaper to run than traditional central heating boilers but from April 2014 they attract tariff payments from the Government’s Renewable Heat Incentive (RHI) scheme. Once you have installed a biomass boiler and been accepted into the RHI scheme, tariff payments are guaranteed, are linked to the Retail Price Index and are paid for 7 years to domestic participants and 20 years to non-domestic participants. Domestic RHI tariff payments can be claimed by householders who install biomass boilers, biomass pellet stoves, solar thermal water heating systems, ground source heat pumps and air source heat pumps. Biomass boilers are ideal for households who do not have access to mains gas such as farms and homes in rural areas, due to the high running costs of central heating boilers which use LPG and heating oil. Using December 2013 fuel prices, biomass energy costs around 4.3 pence per kilowatt hour (kWh) to generate, whilst heating oil costs 6.4p/kWh and LPG a staggering 8.6p/kWh. This means that generating biomass renewable energy is just over 30% cheaper than energy from heating oil and half the price of LPG. Also, the price of LPG and heating oil seem to rise as the temperatures fall whereas the cost of biomass wood pellets tends to be influenced much less by global changes in the energy market and political tension in gas and oil producing countries. What Is Biomass? – Biomass is a term used to cover all organic material which has derived from a living thing. Biomass fuel for boilers usually means carbon-based materials which can be burned to release heat energy, such as logs, wood chips, briquettes or wood pellets. 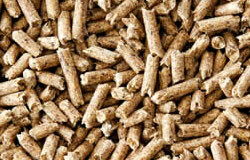 Biomass wood pellets for domestic biomass boilers are often formed from compacted sawdust and wood shavings and provide a convenient, high energy fuel. What is the Biomass Carbon Cycle? – The biomass carbon cycle refers to the process by which carbon dioxide is absorbed by living plants and trees and is then released when they have been converted into biomass fuel and burned. The biomass cycle continues when yet more trees are planted, and whilst growing, they absorb more carbon dioxide. Produced in this way, biomass fuel is said to be carbon-neutral and if forests are developed in a sustainable way, biomass is also a renewable energy. If you install a biomass boiler, to continue claiming Domestic RHI tariff payments you must purchase biomass fuel from a supplier on the RHI Biomass Suppliers List as these suppliers will have been vetted and accredited to supply biomass fuel which complies with the Domestic Renewable Heat Incentive scheme criteria. What is a biomass boiler? – Biomass boilers burn biomass fuel such as wood pellets to generate heat, rather than burning heating oil, LPG or natural gas. Biomass boilers are larger than oil and gas boilers due to the size of the combustion chamber and the integrated hopper from which wood pellets are fed into the boiler. Biomass boilers can generally be connected to your existing network of pipes and radiators if you have an existing gas or oil-fired central heating boiler. Biomass boilers are an eligible renewable energy heating system under Domestic RHI criteria and are not only less expensive to operate than LPG and oil-fired boilers but they also attract RHI tariff payments. The Carbon Trust describes biomass heating as one of the few “cost effective and practical ways to provide space heating and hot water from a low carbon source”. How do biomass boilers work? – Biomass wood pellets are fed from an integrated hopper into the biomass boiler’s combustion chamber where they burn to produce hot gas. Heat from the gas is transferred by a heat exchanger, to water in your central heating system and is also used to heat water for your domestic hot water supply. The rate at which biomass fuel is fed into the combustion chamber of a biomass boiler determines the amount of heat energy which is produced by it and in this way biomass boilers are just as controllable as conventional central heating boilers. Modern condensing biomass boilers take potentially lost heat from waste gas and use it to pre-heat water before it is heated by the boiler, in this way biomass boilers can operate at nearly 100% efficiency. Biomass boilers create waste gas just as a gas or oil-fired boiler will do, but they also create a very small amount of waste ash, which although it has to be removed regularly, can be used in your garden as a fertiliser. How much is a biomass boiler? – Biomass boilers are more expensive than gas and oil boilers, partly because of their complexity but also because they are manufactured in much smaller numbers. In 2014 the cost of a domestic biomass boiler with an automatic wood pellet feeder, including installation and VAT at 5%, capable of providing the heat output required by a four bedroom house would be between £12,000 and £18,000. However, by installing a biomass boiler and claiming Domestic RHI tariff payments, more than double this amount may be saved in heating bills and earned from RHI tariffs during the seven year claim period for Domestic RHI. The popularity of the Domestic RHI scheme is expected to cause prices of biomass boilers to fall over the years as more competition is introduced into the market. A technical survey needs to be carried and an EPC prepared to assess the annual heat demand of a property before the correct size of biomass boiler can recommended for any property. Only then can you get an accurate quote for a biomass boiler which is adequate for your home. Can I install any biomass boiler? – Biomass boilers must meet the standards set by the Microgeneration Certification Scheme (MCS) or an equivalent scheme and they must be designed to use biomass-only fuel in order to satisfy the requirements of the Domestic RHI scheme and attract RHI tariff payments. The MCS is supported by the Department of Energy and Climate Change and is an internationally recognised quality assurance scheme for renewable energy electricity and heating systems. Additionally, your biomass boiler installer must be accredited by the MCS and have signed up to the Renewable Energy Consumer Code. What size of biomass boiler will I need? – The energy output of domestic biomass boilers ranges from around 10 kilowatts up to 30 kilowatts. A biomass boiler capable of providing all of the heating and hot water requirements of a typical four bedroom house would probably need to have an output of 20 kilowatts. Heat load calculations have to be carried out for a property to assess its maximum heat demand and annual heat demand before advising the recommended size of a biomass boiler. How much do biomass boilers cost to run? – Using December 2013 fuel prices, biomass energy from a modern condensing biomass boiler costs around 4.3 pence per kilowatt hour (kWh). This means that for a property with an annual heat demand of 20,000 kilowatt hours, the annual heating bill will be £860. This compares well to heating oil (comparable figures are 6.4p/kWh or £1,280 per year) and LPG (8.6p/kWh or £1,720). Biomass wood pellet fuel costs around £210 per tonne (December 2013) including VAT and delivery. Although these savings in heating bills are significant, they are overshadowed by the amount of Domestic RHI tariff payments which can be claimed if you install a biomass boiler. The Domestic RHI tariff for biomass boilers at the introduction of the Domestic RHI scheme in April 2014 was 12.2 pence per kilowatt hour of renewable heat energy generated and used. In this example of a biomass boiler generating 20,000 kilowatt hours of heat energy, the annual Domestic RHI tariff would be £2,440 making a total annual saving of £3,300 compared to using LPG. If I install a biomass boiler, will I need back-up heating? – Modern condensing biomass boilers are more than capable of dealing with the heating and hot water requirements of domestic properties. But just as with the installation of a conventional central heating boiler, you need to ensure that it is the correct size in terms of heat output for your home. Do I have to install a meter for my biomass boiler? – You will only need to install a meter if, in addition to your biomass boiler you have another heating system to heat your home, OR you have more than one renewable heating system, such as a biomass boiler and a biomass stove, OR your home is occupied for less than six months, OR your biomass boiler is installed in a second home. What is the Domestic RHI Metering and Monitoring Service Package? – The Domestic RHI Metering and Monitoring Service Package works like a service contract and allows you to monitor but not control your biomass heating system by logging onto a website. It can help you to analyse your heating system’s performance and it is also accessible by your installer who can use it to help identify any problems. As an incentive, those who opt for the Metering and Monitoring Service Package for biomass boilers will be paid an extra £200 per year during the seven year claim period for the Domestic RHI. Will I need a flue for a biomass boiler? – All central heating boilers produce waste gases and biomass boilers are no different. However, whilst a condensing gas boiler will require a fan assisted flue on an outside wall, a biomass boiler needs a chimney or flue to take exhaust gases to the outside. Traditional brick chimneys will need a flexible stainless steel double-skinned liner or if you do not have an existing chimney a new pre-fabricated flue must be installed. How reliable are biomass boilers? – Modern condensing biomass boilers are just as reliable as gas, LPG and oil-fired boilers as long as good quality wood pellets are used. 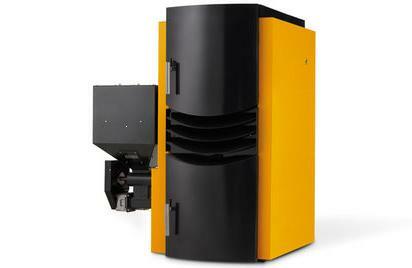 How much maintenance do biomass boilers require? – All central heating boilers should have an annual service but because biomass boilers rely on a clean chimney or flue to operate efficiently, they will also need to be cleaned of soot. Burning biomass wood pellets creates waste ash and although it only amounts to less than 0.5% by weight of the original biomass fuel used, the ash grate will have to be emptied regularly. Some of the more expensive biomass boilers compact waste ash so that it needs emptying less often and some automatically remove ash into an ash bin. Owners of domestic biomass boilers should also allow around £150 per year for an annual service and to clean the flue or chimney of soot. How can biomass boilers be considered carbon-neutral if they have carbon dioxide emissions? – Burning any carbon-based fuel results in carbon dioxide emissions but fossil fuels such as oil and gas cannot be considered renewable forms of energy because they take so long to be formed and supplies cannot be renewed at our current fuel usage rate. Since biomass fuel comes from recently living trees, new trees can be grown at a rate which matches biomass wood pellet usage and therefore biomass fuel is renewable. As for carbon dioxide emissions, trees absorb carbon dioxide when they grow and when they are converted into biomass fuel they emit that carbon dioxide as the fuel is burned. Biomass fuel can be considered carbon-neutral because the amount of carbon dioxide emitted by biomass fuel is the same as the amount of carbon dioxide absorbed by the trees that were converted into that biomass fuel. The biomass carbon cycle continues as carbon dioxide is absorbed then released, to be absorbed again ad infinitum, thus making biomass fuel carbon-neutral in the long term. In fact, if instead of being converted to biomass fuel, if a dead tree was allowed to rot away, as it decomposed it would release exactly the same amount of carbon-dioxide as it would have done had it been converted into biomass fuel and burned. Using biomass fuel simply speeds up the process. Do biomass boilers need planning permission? – Biomass boilers do not normally need planning permission but it may be different if you live in a listed building. Planning permission is sometimes required for a new chimney if it you need one so you should check with your local planning office. Can I install a biomass boiler in an Air Quality Control Area? – Most modern biomass boilers operate cleanly enough to be exempt from exclusion in Air Quality Control Areas and can therefore be used in these areas. How much are Domestic RHI tariff payments for biomass boilers? – Domestic RHI tariff payments for biomass boilers are paid at a rate in pence, per kilowatt hour of renewable heat energy generated and used. Because at the time of the introduction of the Domestic RHI scheme biomass boilers do not have to be metered, the actual calculation is taken from the annual heat demand as shown by the EPC. When the Domestic RHI scheme was introduced in April 2014 the RHI tariff for biomass boilers was 12.2 pence per kilowatt hour. This means that for a property with an annual heat demand of 25,000 kilowatt hours, the annual Domestic RHI tariff payable would be £3,050 (25,000 kWh @ 12.2 pence). Do I need a Green Deal Assessment when I install a biomass boiler? – A Green Deal Assessment (GDA) will be required when you install a biomass boiler if you intend to claim Domestic RHI tariff payments because to meet the criteria of the scheme you will need to prove that your home has adequate loft insulation and cavity wall insulation. A GDA will also be required if you are applying for a Green Deal loan to help towards the cost of installing a biomass boiler. If you have had a GDA carried out already you will not need another, simply quote the GDA advice report number on you Domestic RHI application. Can I get a Green Deal Loan for a biomass boiler? – Green Deal Loans are available for biomass boilers but due to the Green Deal Golden Rule (where the loan has to be capable of being repaid out of savings in energy bills alone) it is likely that the Green Deal Loan will not cover the full cost of the biomass boiler. Do I need an EPC for a biomass boiler? – Domestic RHI tariffs are only payable in respect of properties which are capable of having an EPC prepared for them so, in short, yes. Also, for biomass boilers, the amount of the Domestic RHI tariff payment payable to you is calculated from your home’s annual heat demand which is determined as part of the EPC report. Without an EPC the amount of the Domestic RHI tariff due to you cannot be calculated. How much wood pellet fuel does a biomass boiler use? – Biomass wood pellets produce around 4,900 kilowatt hours of heat energy per tonne so if the annual heat demand of your home is 20,000 kWh, it suggests that you will need just over 4 tonnes of biomass fuel (20,000 ÷ 4,900 = 4.082). You then need to adjust this figure to take account of the relative efficiency of your biomass boiler. If your biomass boiler operates at 95% efficiency, you will actually need 4.3 tonnes of biomass fuel each year (4.082 ÷ 0.95 = 4.30). Where can I buy biomass wood pellets? – To continue receiving Domestic RHI tariff payments, householders who install biomass boilers must purchase their biomass fuel from an accredited supplier from the RHI Biomass Suppliers List. Suppliers of biomass wood pellet fuel will only be placed on the Biomass Suppliers list if they can prove that the biomass fuel that they supply meets greenhouse gas emissions criteria and also that their supply of biomass fuel is from sustainably grown timber. The only exception to this is where the householder is a registered ‘self-supplier’ of biomass fuel and meets the requirements of the Domestic RHI scheme in this respect. Ofgem has stated that they will carry out checks to ensure that only the use of biomass fuel from accredited sources will attract Domestic RHI payments and anyone found to be flouting the rules could have their RHI tariff payments stopped. Can I use my own wood fuel? – To continue receiving Domestic RHI tariff payments you can only use your own wood fuel for your biomass boiler if you are a registered ‘self-supplier’ of biomass fuel with Ofgem. How is biomass wood pellet fuel delivered? – Domestic supplies of biomass wood pellets are normally supplied in 10 to 15 kilogram bags and placed on pallets capable of carrying up to a tonne of biomass fuel. Deliveries are normally made by a lorry with a tail lift. For larger deliveries to commercial organisations biomass wood pellet fuel can be supplied loose and it is blown through a pipe into a silo. It would make sense to have your biomass wood pellets stored in a place where it is easy to accept deliveries to but not too far away from the boiler either. How much storage space will I need for biomass fuel? – The bulk density of biomass wood pellets is 650 kilograms per cubic metre so if you have a tonne at a time delivered you will need around 1.5 cubic metres of space. A dry shed is usually adequate for this. Will a biomass boiler connect to my existing central heating system? – Normally a biomass boiler can be connected to an existing gas or oil-fired central heating system’s pipes and radiators without much difficulty though a new heat exchanger may be required because biomass boilers operate at higher temperatures than most other types of boiler. How much space do I need for a biomass boiler? – Biomass boilers are larger than most gas and oil-fired boilers due to the integrated hopper (which holds the wood pellets) and the large combustion chamber which is lined with refractory bricks. Biomass boilers are also floor standing so you will probably need a firm concrete pad of at least one square metre to sit it on. You will also need space to store the biomass wood pellet fuel but a dry shed should suffice. Who can install a biomass boiler? – Only installers of biomass boilers who are accredited under the Microgeneration Certification Scheme (MCS) or an equivalent scheme can install your biomass boiler if you wish to claim Domestic RHI tariff payments. The installer should also have signed up to the Renewable Energy Consumer Code. Do I need to fit a carbon monoxide alarm when I install a biomass boiler? – Yes. It is a legal requirement to fit a carbon monoxide (CO) detector in the same room where new or replacement solid fuel appliance is installed. The requirement is part of Building Regulations and applies to biomass boilers and biomass stoves. This is extremely important as carbon monoxide has no colour, smell or taste but is potentially deadly. A suitable carbon monoxide detector needs to have an audible alarm, be self-testing and also have a ‘battery failed’ alarm. It is not recommended to use a colour coded carbon monoxide indicator card. Can I claim Domestic RHI tariff payments for a biomass boiler in a second home? – Yes but the biomass boiler must have a meter fitted to measure the amount of renewable heat energy it generates, even though the Domestic RHI tariff payment will still be calculated based on the annual heat demand of the property as shown in the EPC. Does a log-burning boiler qualify for Domestic RHI tariff payments? – Because a log burning boiler is capable of burning non-biomass fuel it will not qualify for Domestic RHI tariff payments.